Advice for choosing & using sealants to repair a leaky or worn roof surface, or to repair roof flashings, valleys, and intersections with other building surfaces. Roofing sealants have been applied for centuries using just about anything at hand: tar, pine-sap, even sugar to try to seal leaks in a roof that's damaged or at the end of its life. Eking out a few more months or years of roof life an be very tempting but a more legitimate use of sealants is one that is more constrained. 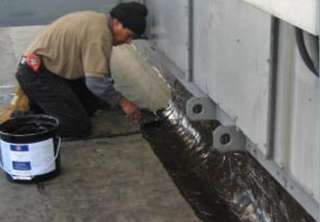 Roofing mastics: properly, a thick paste applied by trowel, putty knife, or using a caulking gun and used to seal exposed nail or screw heads or small areas of damage, cracks, holes in roofs, as well as along edges of abutting roof materials such as along the top edge of counter-flashing let into a chimney or into a masonry wall. Some roofing mastics such as the traditional black asphalt roof flashing cement include reinforcing fibers. Mastics are also used as adhesive to glue-down loose shingles and mastics are also widely used as adhesives in other building applications such as flooring. Roofing sealants: properly, liquid coatings applied by roller or brush onto large areas of a roof surface to seal or extend the the life of a leaky or worn roof surface. Some sealants can be used on many different roof materials such as asphalt shingles, roll roofing, modified bitumen, even tile or slate (though I don't recommend that), while others are compatible only with specific roof coverings, so be sure to read the manufacturer's label as well as the roof sealant instructions from the manufacturer of your roof covering. Cut-back adhesives or sealants are products that have been thinned using a compatible solvent to produce a thinner coating that may be painted onto a surface and that may penetrate into it. 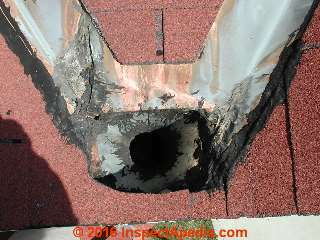 The skylight repaired with asphalt flashing cement (above) is discussed at SKYLIGHT LEAK DIAGNOSIS & REPAIR. There are several types of sealant or coating products used on building roofs by composition. Both mastics and more liquid roof sealants may have similar ingredients. Acrylic mastics and sealants, acrylic polymer based products. Asphalt-based mastics and sealants use asphalt, a petroleum product, as the primary ingredient, typically fiber reinforced. Asphalt based sealants can be cleaned-up or thinned with paint thinner or mineral spirits. Asphalt based products are also referred to as bituminous or bitumens. Emulsified asphalt-based mastics and sealants also use asphalt with the addition of bentonite clay as an emulsifier that reduces flowing and cracking. Silicone Roof Sealants, sold in caulking tubes or in gallon cans, are silicone based coatings and sealants that can be applied over many types of building surfaces, providing good adhesion, good UV resistance, and unlike the asphalt and bituminous products silicone sealants do not harden nor shrink with age. Silicone roof products are sold for application by caulk gun, brush, or trowel and in a range of colors: clear, black, white, brown and others. Surfactant-treated Roof Coatings add a wetting agent to improve penetration or coating bonding to damp or wet roof surfaces. Polyurethane Roof Coatings & sealants including some spray-on products may be used as patching or repair coatings on asphalt roofs. Watch out: as you'll see when shopping for roof patching, sealing or coating materials, manufacturers may mix these terms. For example Vinimex®, a widely used liquid roll-on roof sealant is labeled by Comex®, its manufacturer, as a roof mastic. Watch out: some older roof mastics or sealants contained asbestos as a reinforcing fiber and some may have also included asbestos powder as a filler. See MASTIC, CUTBACK ADHESIVE, FLASHING CEMENT ASBESTOS for details. Because builders, contractors, roofers, and vendors use and mix and match so many similar terms for roofing coatings, mastics and sealants we list all of them below along with some illustrations and descriptions of how these products are applied and of their intended use. 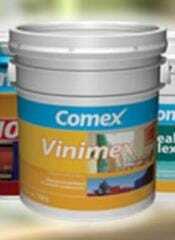 Prices for roof sealant/mastic/cement range from less than $10. for a tube of caulk-like sealant to over a thousand for a thick silicone-based roof sealant coating in a 5-gallon container. Don't buy any sealant or roof cement before reading on the product label the roof material types with which it's compatible. Acrylic roof coatings or sealants are based on the use of polymers that produce hard, flexible coatings that have been incorporated into a waterborne emulsion. 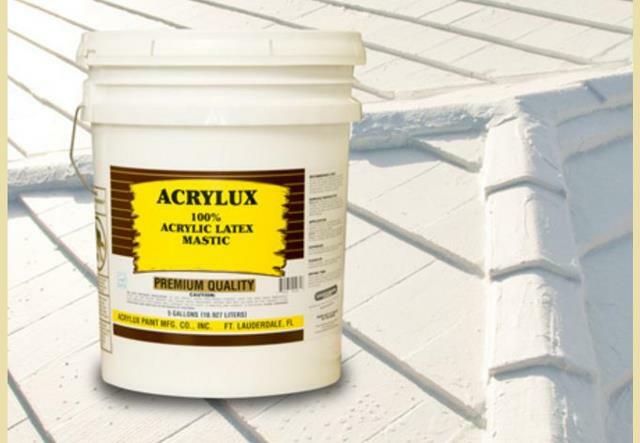 Acrylic latex paints are the most-widely used form of these products along with acrylic polymer caulks or sealants. According to National Coatings, a producer of roof coatings, acrylic roof coatings should not be considered as a paint - because of the grater thickness of the coating formed. Acrylic elastomeric roof coatings refer to a liquid-applied monolithic (seamless), fully adhered, elastomeric membrane that’s formed in situ on the roof. These coatings are applied 5 to 10 times thicker than a house paint. Typically, the thickness of an exterior house paint is 3 mils, .003 inches. For elastomeric roofing applications, these would be 15 to 30 mils. So we’re talking about membrane-like materials. EPDM is often 45 mils; HypalonR and PVC are 60 mils. However, with these coatings the membrane comes out of a can. Asphalt mastics include coatings and trowel-grade flashing cements based on asphalt or coal tar products used for installing flashings, sealing seams, and repairing blisters in asphalt-based roofs such as roll roofing and asphalt shingles. Both hot and cold-application forms of asphalt roofing products are available. Bituminous dampproofing - for "bituminous" see asphalt products described above. Cut-back or thinned asphalt coatings are also used as foundation dampproofing agents. In that application the coating does not span nor seal holes, gaps, or cracks. Cold applied roof cement, in comparison with "hot tar" roofs, cold applied roof cement or coating describes an asphalt or bituminous sealant or cement that can be applied without heating. Elastomeric Roof Coatings, also referred to as rubber-based coatings or liquid rubber coatings, used on EPDM roofs. Elastomeric roof coatings usually require a two-coat or three-coat process, beginning with a primer, adding a base coat and finishing with a top coat. 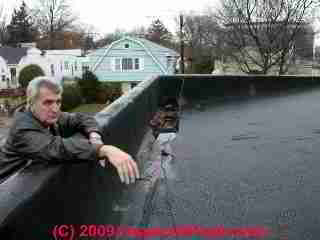 Also see rubber roof coatings. 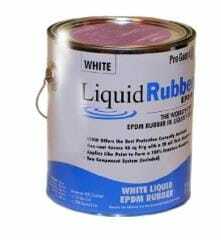 Plastic roof cement, Plastic roof cement is a trowel-on or caulk-gun applied flashing cement product for residential use using an SBS (Styrene-butadyene-styrene) modified-bituminous roofing sealant. SBS sealants are non-hardening and non-drying, sold as adhesives, sealants, and flashing tapes. SBS Sealants are produced by several manufacturers including Chemtron. [SBS modified bituminous membrane roofs are a hybrid roofing system combining built-up multiple plies of roofing sheets using styrene-butadyene-styrene (SBS)-modified bituminous membrane roofing. ] 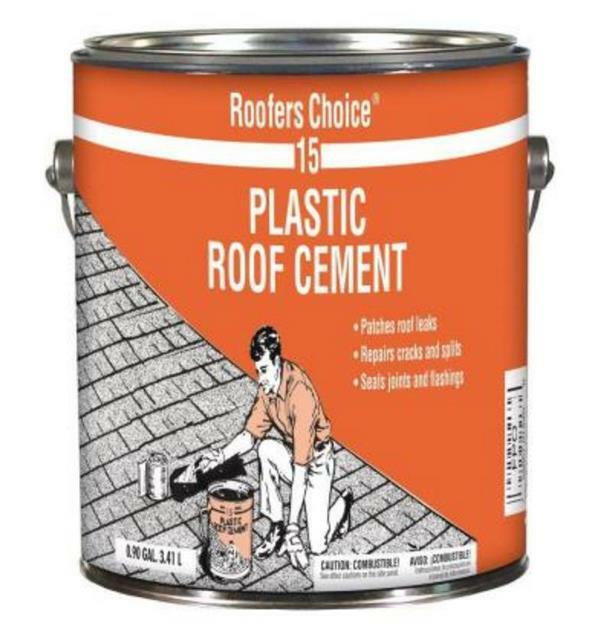 Shown below, Roofers Choice brand plastic roof cement in a one-gallon container. 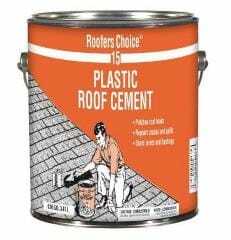 Roof cement - see roof flashing cement. Roof patching compound - generic term for both coatings and trowel-on or caulk-gun applied roof repair products. Roof flashing cement is a dense or thick sealant paste applied by trowel or from a tube, used to seal small cracks, holes, gaps, or at intersections of flashing or roofing and other building surfaces. Roof sealant, generic term for roof coatings, caulks, compounds. Liquid sealants are intended for brushing or rolling over an area; much more dense sealants are applied by trowel or dispensed from a tube using a caulking gun. 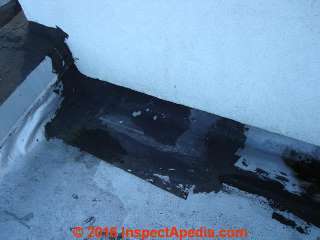 See FLAT ROOF LEAK REPAIR for details. Product description: Impermeabilizante acrílico de alto poder cubriente que forma una capa homogénea capaz de impermeabilizar todo tipo de superficie, aún en superficies verticales. Cuenta con garantía de 3 ó 5 años. Ideal como reflejante en techos y azoteas, lo cual colabora en el ahorro de energía y evita el calentamiento de las viviendas. Roof "tar" is typically a more liquid sealant that if improperly applied can make a horrible mess on the roof as you can see in our second photo below. Hot applied tar has been widely used for nearly 100 years as an inter-ply coating in built-up roofing. Below our client is looking at a tar-coated low-slope roof. See BUILT UP ROOFS for details of that use of roofing tar. Tar is occasionally mis-applied as an adhesive as we illustrate below. See ASPHALT SHINGLE TARRY BLEED for details about the messy roof shown above. Silicone roof coating, a paint-on silicone-based roof coating, typically provided in white, reflective aluminum, or possibly other colors. 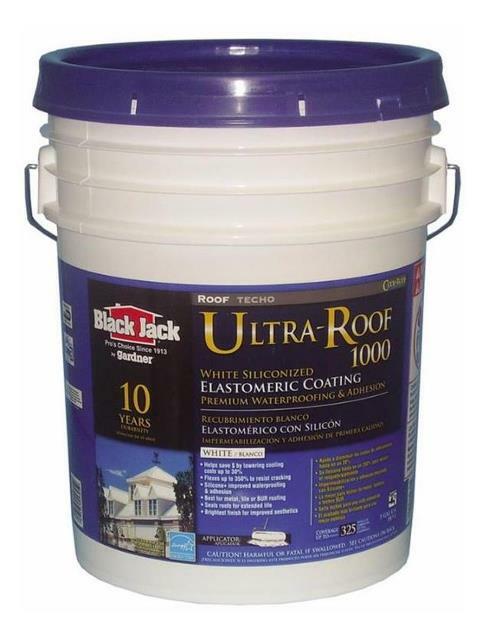 Shown below, Black Jack Ultra Roof 1000, white siliconized elastomeric roof coating. 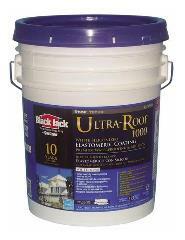 Black Jack is a Gardner-Gibson product sold at building supply stores. Wet and Dry Roof Cement - generic term for roof mastics or sealants that include a surfactant to improve coating performance when applied over wet or damp surfaces. Watch out: Be sure to read the application instructions and roof material compatability remarks provided by the manufacturer of any roof patching compound or sealant you are considering buying. Applying the wrong sealant can actually damage a roof covering if its solvents are not compatible with the roofing material. In particular, some roof coatings or flashing cements are not compatible with asphalt shingles, asphalt roll roofing, EPDM, rubber, or modified bitumen roof coverings. Despite standards and claims, in our opinion there is no single "right answer" to "how long will this coating, patch or repair last?" I've inspected 20-year old roof coatings in remarkable condition and I've seen coatings and repairs fail from the day after installation. But certainly some materials are more resistant to the wear-forces at work (heat, UV, thermal movement) than others, as we elaborated in the list of coatings and mastics above. 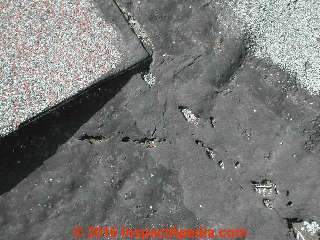 Below we illustrate use of a black asphalt-based flashing cement on a roof surface. Observe how it has aged, dried, shrunk, cracked. Watch out: as we illustrate in seveal photos throughout this article, applying most sealants across large or long gaps, cracks, or openings without adequate reinforcement by a mesh or fabric is likely to be a short-lived repair. Heat causes the loss of volatiles from roofing mastics and sealants, causing most products to become more brittle with age. UV radiation also weakens the material and probably oxidizes some of its constituents. Thermal movement caused by changing temperature then pulls-apart and cracks the sealant, as we illustrate above. If I were using a roofing mastic to repair a valley I'd pick up a reinforcing mesh sold alongside the mastic in any building supply house; those mesh reinforcers may be fiberglass or synthetic fabric. The mesh gives tensile strength to the repair by being placed down onto the surface and smeared over with mastic sealant. That adds some life to the job. Here we illustrate a typical application of roofing cement along the intersection of a roof flashing and wall where leaks had occurred. Over time the combination of drying out of the sealant, thermal changes, and movement cause the sealant to crack and leak again. I've also re-lined valleys and built-in eaves-trough gutters or yankee gutters with self-adhering ice and water shield products. Butterfield, W. L., and Fred H. Haney. "Asphaltic Grouts, Mastics, and Cold Applied Cements." In Symposium on Bituminous Waterproofing and Roofing Materials. ASTM International, 1960. Cement, E. Plastic. "Flashing grade, fibrated asphalt roofing cement." ASTM D 4586. De Buyl, Francois. "Silicone sealants and structural adhesives." International Journal of Adhesion and Adhesives 21, no. 5 (2001): 411-422. Lotter, Jason T., Ben Roberts, John L. Henshaw, and Jennifer S. Pierce. "Airborne asbestos exposures associated with the installation and removal of roofing products." Journal of occupational and environmental hygiene just-accepted (2016): 1-35. Mowat, Fionna, Ryan Weidling, and Patrick Sheehan. "Simulation tests to assess occupational exposure to airborne asbestos from asphalt-based roofing products." Annals of Occupational Hygiene 51, no. 5 (2007): 451-462. Partanen, Timo, and Paolo Boffetta. "Cancer risk in asphalt workers and roofers: Review and meta‐analysis of epidemiologic studies." American journal of industrial medicine 26, no. 6 (1994): 721-740. Paustenbach, Dennis J., Amy Sage, Michael Bono, and Fionna Mowat. "Occupational exposure to airborne asbestos from coatings, mastics, and adhesives." Journal of Exposure Science and Environmental Epidemiology 14, no. 3 (2004): 234-244. Quek, Udo, and Jürgen Förster. "Trace metals in roof runoff." Water, Air, and Soil Pollution 68, no. 3-4 (1993): 373-389. Shahin, Mohamed Y., David M. Bailey, and Donald E. Brotherson. Membrane and Flashing Condition Indexes for Built-Up Roofs Volume II: Inspection and Distress Manual. Building Research Council. School of Architecture. College of Fine and Applied Arts. University of Illinois at Urbana-Champaign, 1990. TILES, CLAY ROOF. "SECTION INCLUDES Roof tiles. Flexible sheet membranes for eave protection, underlayment, and valley protection. Associated metal flashings. Accessories." WORMSER, ERIC S., and KENNETH K. KAISER. "Roof Coatings." Paint Handbook (1981): 1. Wypych, George. Handbook of material weathering. 2003. My recently purchased 1960's house with a two-layer asphalt roof has a leaking valley. The rest of the roof seems sound (excepting need for gutters, etc.). I want to repair this myself (and a roof tear-off is simply not a financial option right now). What challenges might I face beyond replacing the roof roll and the puzzle-like replacement of two layers of shingles? Shown below: hanging plastic bags in the attic (or putting buckets under leaks) makes sense as an emergency stop-gap way to face some roof leaks but it's hardly a reasonable nor effective repair. 3. finding it difficult to cut nails and lift shingles on the older roof sufficiently to place down a new layer of valley liner. If the roof is in the last 1/4 of its life I'd prefer to stay off of it as much as possible: brittle shingles easily damaged by foot traffic; I might try working with care on padded surfaces to patch or seal the valley - a "band-aid" temporary repair that you can make more durable if you combine a fabric with your roof mastic to seal the valley. Reader follow-up: what tools do I need? Point number 3 is more along the lines I meant--sorry to leave you a vague question. We had a cricket added to the chimney, due to leaking there caused mostly by tar repairs causing dams, and general neglect. It appears tar dams are the primary culprit for leaking along this valley, as well. I plan to inspect the roof deck from inside the attic to determine the extent of the roof deck damage. I do plan to use rope/safety gear when on the roof for this extended period of time. What tools should I have ready to remove the shingles and nails? I generally do not recommend roof repairs by someone with no experience, no training, and no one with experience to help them, because of the risks involved. A problem is that you don't know what you don't know - you don't even know that you're missing something; the result is possibly an unnecessarily costly and ineffective or short lived repair. While small repairs such as sealing a little hole or leak in a roof are within the grasp of many homeowners who are otherwise able to tackle the dangers of fooling around on a roof, even then I'd at least read some roofing instruction guides or get help from someone with experience and training. Asphalt shingle roofs use normal carpentry & roofing tools including a few flat bars; when pulling up a lot of shingles roofers use a stripping tool but typically one can get by with a short-handled flat-bladed shovel; the added width of the blade can reduce un-wanted shingle damage. Occasionally I'll use a slater's nail cutting tool - that's a long flat bar with notches - the tool can be driven up under shingles and then hammered down to cut nails. You shouldn't need that for repairing a valley. For applying roof mastic I use a small mason's trowel and of course disposable clean-up solvent & towels. Often having a pair of trowels or a trowel and a putty knife allow me to scrape mastic off of one blade onto another for more careful and detailed work. Be careful how you dispose of that trash: leaving it in a hot trash can can start a fire. Keep in mind however that if you only seal the open surface of the valley water may back up under the shingles that abut the valley and might still leak, particularly if the valley doesn't drain rapidly off of the roof. All of this to me sounds as if patching valleys by coating is the cheapest, quickest job that's also short-lived and a bit ugly. 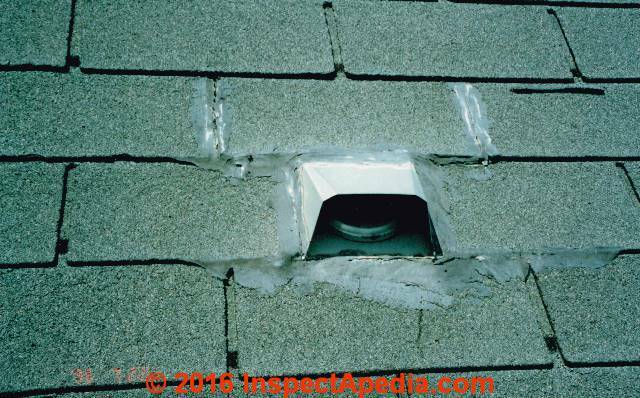 But doing a proper valley-liner replacement requires lifting shingles along the valley; on an old roof you'll find the shingles fragile. Reader follow-up: what's roofing mastic? And would you please expand your roof mastic comment--my research so far on repairing the valley has not included roof mastic. Thank you so much! Photo: roof sealant used around a dryer vent installed through a roof surface. [Click to enlarge any image] Take a closer loo9k to see how this sealant has dried and cracked. Roofing mastic aka roof flashing cement is a thick tarry sealant, typically sold in gallon or larger sized containers or more expensively in caulk/sealant tubes for very small jobs. I'd consider coating with a high quality rubber roof sealant unless the damage in the valley is severe. The roof cement is traditionally an asphalt-based product with reinforcing fibers. 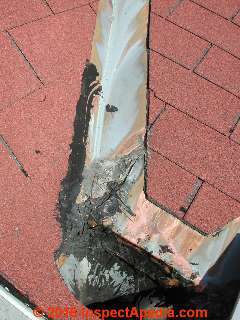 There are other substitute roof leak sealing coatings including thick paints. All roofing mastics will in my experience ultimately fail by drying out and cracking, though there are some rubber roof coating products that claim they're immune from that problem. 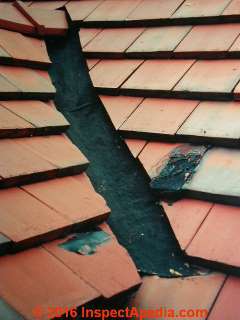 The copper roof valley shown above cracked and leaked from thermal movement; you can see that repairs were attempted using a black asphalt-based flashing cement. Unfortunately not only did the flashing cement give only short term relief, its chemistry attached the copper below, thinning and corroding the copper. Below is another example of roof flashing cement failure on the same roof. Continue reading at ASPHALT SHINGLE TARRY BLEED or select a topic from closely-related articles below, or see our complete INDEX to RELATED ARTICLES below. 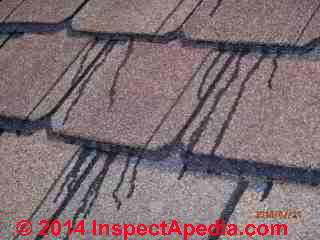 ROOF SEALANTS & MASTICS at InspectApedia.com - online encyclopedia of building & environmental inspection, testing, diagnosis, repair, & problem prevention advice. Falchetto, Augusto Cannone, Mihai O. Marasteanu, and Herve Di Benedetto. "Analogical based approach to forward and inverse problems for asphalt materials characterization at low temperatures." Journal of the Association of Asphalt Paving Technologists 80 (2011). Due to the potential to realize environmental benefits related to lower production temperatures, implementation of Warm Mix Asphalt (WMA) has generated interest at state and national levels. However, from the standpoint of sustainability, WMA must meet or exceed the performance of conventional HMA. Consequently, successful implementation requires mix design procedures that consider the impacts of reduced production temperatures on material properties and the overall performance of the mixture. In this study the effects of reduced aging temperatures were evaluated through characterization of asphalt binder properties after short-term aging at standard and lowered RTFO temperatures and long-term aging under standard PAV conditions. Materials tested included two asphalt binder sources and three WMA additive types. It was found that reduced aging temperatures have a significant influence on the high temperature performance of binders, but a negligible effect on intermediate and low temperature rheological properties evaluated after PAV aging. Results were modeled based on the procedures provided in NCHRP 9- 43 to define the maximum allowable reductions in production temperature for the materials tested in this study. Preliminary findings indicate that the predicted temperature reductions for the FHWA aging model and the laboratory generated data set differed by 9 C, indicating that refinement of the model through evaluation of additional binder sources, grades, and WMA additives is needed. In addition, the need for establishing minimum production temperatures for WMA to ensure adequate field performance is emphasized, due to the observation of similar sensitivity to aging temperature in mixture performance testing. Jones, David S.J., and Peter P.Pujado (Editors) (2006). Handbook of Petroleum Processing, First Edition. Springer. ISBN 1-4020-2819-9. Newcomb, David E., Mary Stroup-Gardiner, Brian M. Weikle, and Andrew Drescher. "Properties of dense-graded and stone-mastic asphalt mixtures containing roofing shingles." ASTM SPECIAL TECHNICAL PUBLICATION 1193 (1993): 145-145. Noone, MICHAEL J., and W. KENT Blanchard. "Asphalt Shingles–A Century of Success and Improvement." In Proceedings of the 10th Conference on Roofing Technology, pp. 23-33. 1993. Parker, Danny S., and John R. Sherwin. "Comparative summer attic thermal performance of six roof constructions." TRANSACTIONS-AMERICAN SOCIETY OF HEATING REFRIGERATING AND AIR CONDITIONING ENGINEERS 104 (1998): 1084-1092. Shaw, DONALD E. "ARMA’s New Approach for Evaluation of Asphalt Shingle Wind Resistance." In Proceedings of the Third International Symposium on Roofing Technology, p. 216. 1991. Terrenzio, LOUIS A., JOHN W. Harrison, DAVTO A. Nester, and M. L. Shiao. "Natural v. artificial aging: use of diffusion theory to model asphalt and fiberglass-reinforced shingle performance." In Proceedings of the Fourth International Symposium on Roofing Technology. 1997. Roof shingle temperature increases due to attic radiant barriers are 2 to 5 degrees Fahrenheit. Roofing material warranties are not affected by the installation of attic radiant barriers. Jim Todd, provided photographs and description of shingle blister rash on a four year old Atlas Chalet™ shingle roof. 9 July 2009.